After a bit of a hiatus, Rooney is back in fine form – making new music and touring. The Rock and Roll Hotel was ready! 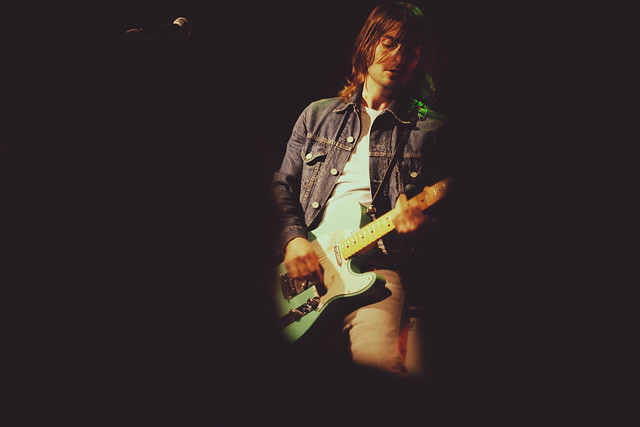 As the band took initial positions, Robert Schwartzman, the only returning member from the original line-up (early 2000’s) and the de facto soul of the band, gave the expectant crowd an ironic Guitar Hero pose, guitar thrusting towards the ceiling. Well, maybe not as ironic as intended, because the show was packed with people of many generations pushing forward towards the stage. Rooney does have many followers, as significant portions of the crowd were willing and able to sing along to the lyrics as Robert sang in earnest. Later in the show, a women even got on stage to show her intricate tattoo of the song title “That Girl Has Love” in bold, flourishing script. That is love. Rooney kicked off the show with “Not In My House”, where Robert sang about not being brought down by a women with ‘the devil in you seeping out your pores’. The driving baseline and the kiss off attitude was a good primer for the upcoming show. Their third song, “All the Beautiful People”, introduced material from their latest album, Washed Away. A few songs later they played “Why” from the new album, likely the highlight of that album and the show. A beach sunny, upbeat ode that usually includes a duet on seeking answers to what is happening to a relationship. Robert reached out his microphone and asked the crowd to ‘sing the female part’ (in the studio version, that female is the French pop singer Soko). All told, they only played four songs from Washed Away, instead focused much of their effort during the 17-song set on the first three albums and an upcoming EP. A number of songs had me believing I was listening to Weezer (“My Heart Beats 4 You”) while sipping a Mai Tai on the beach, which is not a bad thing. Not bad at all. They ended the main set with “When Did Your Heart Go Missing?”, a dance-worthy, head-nodding kiss off for the show. They could have ended there, but instead came back for a three song encore – to ensure the tattoo woman got her money’s worth. Besides Robert, the other recently joined members of Rooney are Boaz Roberts (guitar), Sean Sobash (bass), Maxwell Flanders (drums) and Matthew Jordan (keyboard). The band’s name comes from the character Ed Rooney, who was the principal in Ferris Bueller’s Day Off. With that vibe, during the show I gave each band member a nickname in the form of a Hollywood actor – best to chalk that up to exuberance of the moment and the available spirits. Robert assured us that ‘Saturday was the sexiest night of the week’ and no one disagreed nor left the Rock and Roll Hotel unhappy. Rooney has a new EP coming out on July 28th called El Cortez. They played “Second Chances” from the EP during the set, ‘don’t take it for granted’ and miss out. Lastly, the opening band was the LA-based Run River North. They were very good, give them a listen and see them next time they play in DC.